The complete A to Z of wedding flowers guides. Tree with lance-shaped, waxy, dark leaves which make attractive foliage. Its flowers are either single or paired, and are bowl-shaped of a pink or white colour. Large, open, sweetly scented flowers that grow in white and pink. Diamond-shaped leaves, with large clusters of small flowers, usually found in white, greenish-yellow or reddish-purple. Fragrant flowers, either singular or clustered, of a shallow cup-shape with five petals. unusual, white or brightly coloured trumpet-shaped flowered heads on long stems. ‘Mamoratum’ is often used in flower arrangements. Small, daisy-like flowers that are either single or clustered. Colours include white, red, yellow, blue, lilac and purple. Tiny, star-shaped to shallowly trumpet-shaped flowers with five petals. Occur in white or pink. Petite, white flowers with an aromatic scent. Also in pink and purple. Erect, large, saucer-shaped flowers with nine to 12 petals, usually a creamy-white colour. Crest-like flowers often in contrasting colours. Last well when cut. Flowers of a bell or tubular-bell-shape, in blue, white or pink. Can be irritating to skin when touched. Delicate flowers of white, lilac, red or pink. 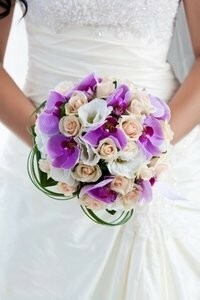 Two great wedding varieties are ‘Bridal Bouquet’ and ‘Snow White’. Long tubes with four petals at the end. Produced either singular or clustered. Colours include pink, orange, red and white, the white variety being scented. Often fragrant flowers, star-shaped, in green or greenish-white. Bowl-shaped or cup to saucer-shaped flower heads, usually with five petals. White, yellow, pink, orange and red. The sap may irritate skin. Bold foliage, with single, paired or clustered open-faced flowers. They are sometimes fragrant, and white, pink, red or yellow. Grow either singular or clustered. Pinks are smaller and with fewer petals. Often fragrant, and come in most colours, or with variegated leaves. Hanging clusters of tiny flowers in long pendants. Needle-like foliage displayed in clusters. Produces cones during Autumn, which are perfect for arrangements. Bowl-shaped yellow flowers that are similar to poppies, with a sap that may irritate skin. Saucer, bowl or cup-shaped flowers with five petals. Usually white, but pink and red also available. Two to three leaflets, light to mid-green leaves with clusters of tiny white flowers. Triangular-ovate to diamond-shaped leaves, bell-shaped cream flowers with star-shaped mouths. Flowers can be single, daisy-like blooms, a head of multiple petals or small or large pom-pom heads. Colours include white, yellow, red, pink and purple. Single or clustered flower heads, with four to ten petals, varying in shape and size. A variety of colours including white, yellow, orange, pink, red, lilac and purple. Small, pea-like flowers with delicate leaves. Spherical or hemispherical flower heads with tubular petals, the outer ones being longer. Cheap so ideal for couples with a limited budget. Saucer to shallow cup-shaped flowers of a white to deep pink colouring. The leaves make good foliage. Clusters of tiny, white flowers accompanied by delicate, lace-like leaves. Some varieties have red, orange and pink rims around the inner trumpet. They grow in a variety of shades of either yellow or white, or a mix of both. Available in single or double blooms, along with a petite variety. Many shapes available, including pom-pom, ball, cactus, orchid, peony and water lily shaped. Grown in many colour variations, including white, yellow, orange, red, pink, purple, cream and burgundy. Simple, solitary flower heads on long stalks with oval leaves, in white, pink or red. Several varieties of shapes – spikes, racemes, panicles, hooded, spurred, single or double. Each plant produces many blooms, either on single or multiple stems. Clusters of small and delicate yellow flowers with feathery blue-green foliage. Small, star-shaped flowers displayed in clusters. Lance-shaped ovate to broadly ovate mid to dark green or red leaves. Grows in a variety of colours – white, pink, yellow, peach and cream. The leaves may irritate skin. Often has an aromatic foliage. Clusters of petal-less flowers of a white or creamy yellow. A shrub comprising of flower heads, which can be solitary, round or pyramidal, at terminals or in clusters. Each flower head is cupped by a bract that can be yellow, red, purple, brown or green. An inexpensive, delicate green foliage. Large, glossy leaves with brightly coloured flower heads of an interesting pendent or contorted shape. Ideal for beach and tropical weddings. Delicate flowers that are occasionally funnel-shaped, and are pink, blue, yellow or white. A shrub that produces yellow flowers with four petals and narrow tubes, in long and short styles. Many inflated, tubular-bell shaped flowers on long stems. Ideal for tropical weddings, these flowers have five petal lobes and are arranged in clusters. Available in cream and yellow. Small, scented, funnel-shaped and brightly-coloured. Pendulous flowers in clusters with short or long tubes and petals around the central tube, forming a cup or bell. White, pinks, reds or purples. Fragrant tubular or funnel-shaped flowers with five to twelve petals, which are white. Large, trumpet-shaped flowers, in shades of intense blue, white or yellow. Saucer-shaped, flat or star-shaped flowers, with blue, pink, purple or white petals that are often veined. Long-lasting single or double Daisy-like flower heads, in red, pink, orange, yellow and purple, with black, yellow or white centres. Cross-shaped or spike-like flowers in shades of pink, purple or white. Each long stalk contains rows of flower heads, each flower made up of six petals. Available in white, peach, pink, purple, red, blue and cream. Stalks can grow up to three feet high. Single, spherical flower heads of white, grey or blue. Pea-like flowers that are either singular or clustered, and are yellow. Many clusters of petite tubular, bell or spherical flowers on each stem. Blue, purple, yellow, cream, white, green or maroon. Usually shallowly cup-shaped and either flat or in rounded clusters, and available in white or deep pink. It produces fruits in Autumn, which are used in flower arrangements. Excellent foliage with yellow catkins. Dense clusters of tiny bell-shaped flowers along the stem, in red, purple, pink and white. Good for winter arrangements. Petite and sweetly scented tubular flowers, usually yellow. Some varieties are almost daisy-like in appearance. Pendant or outward facing saucer, cup-shaped or tubular bell-shaped flowers. Each flower head has five petals. White, cream, pink, purple or green. Can also be spotted. Mainly funnel-shaped, singular or clustered flowers, in red, pink, purple, blue, yellow or white. Beautiful leaf colourings in green, yellow, red and brown. Also produces berries, which are a lovely seasonal choice for Winter and Christmas weddings. Tall, slender, large flowers that are either stalk less, short stalked or funnel-shaped. Each flower five petals, and is brightly coloured. Tall, open terminals of many cross-shaped flowers with four petals. Usually grows in a violet-blue to white. Tubular, funnel or bell-shaped flowers arranged in clusters, some varieties. Long, packed flower heads with as many as forty single or double flowers that are tubular-bell shape. Many colours including purple, pink, cream, orange, yellow, red, blue or white. Fragrant. Flower heads are flat, domed or conical, and are arranged in clusters. White, pink, blue, purple, lilac and greenish-white. Yellow flowers with long stamens. Fruits are also produced which are either three to five half capsules or berries. Fan-shaped flowers of three large outer petals, and three smaller erect inner petals. Tall and small varieties available in red, pink, orange, yellow, white, lilac and blue. Three leaf shapes available – oval-heart shape, three lobed and crested. Grows with many leaf colourings including yellow and green, and makes excellent foliage. Berries make ideal seasonal foliage for Winter and Christmas weddings. Cup-shaped, single or double blooms that are produced either singly or in clusters. They bear apple-like fruits which are edible, scented and yellow to green or purplish-green. Delicate flowers often fragrant with broad or narrow star-shaped segments. Most varieties produce black berries, which add to already attractive foliage. Slender stemmed flowers that resemble <>delphiniums. Long-lasting and can also be dried. Pink, blue or white. A shrub that produces narrowly oval to oblong, dark green leaves. Small white and pink flowers in flattened clusters and egg-shaped dark blue-black fruits. Long-stalked spikes of fragrant purple flowers. The leaves and flowers can be dried and used for pot pourri. Delicate, fragrant white flowers produced singularly or in clusters. Small, tubular flowers that are usually fragrant. White, pink, an almost red, magenta, lilac and blue. Either singular or clustered and often scented. The flowers may be upward facing, horizontal or outward facing. They can be cup, bell or bowl-shaped, and occasionally star-shaped with six petals. Grown in a plain colours (white, yellow, orange, red, lilac, pink, cream), lined or spotted. It is important to remove the stamens to prevent staining. Delicate pendant, bell-shaped flowers that are fragrant and usually white although pink is also available. The flowers have a waxy appearance. Deeply cup or bell-shaped flowers of every colour, that are either singular or clustered. They last well once cut. Upright or hanging catkin-like blooms, full of many densely packed tiny flowers, usually red or green. Some varieties are suitable to be cut or dried. Long, terminal clusters or spikes of pea-like flowers. Can be plain or bicoloured. Solitary pendant, horizontal, cup, goblet or star-shaped. Fragrant with six to nine petals. Pure white, white flushed, stained pink, purple, cream, greenish-yellow or yellow. 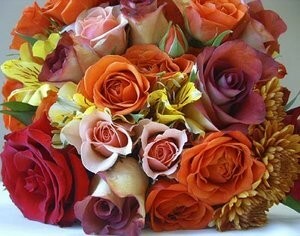 Produce cone-like fruits that can be used as decoration in arrangements at Autumnal weddings. Widely funnel-shaped flowers with spreading petals. Available in a variety of colours. Daisy-like flower heads which last well when cut. Colours include orange or yellow. Simple and aromatic leaves, tubular or funnel-shape. Brightly coloured and last for several weeks once cut. Simple, solitary flower heads in loose, branching clusters and with many petals. A variety of colours including pink, white, purple, lilac and blue. Petite yellow, pea-like flowers each with four to five petals. Lightly clustered in spherical heads either singular, spiked or grouped. Produce fruits during a hot summer, which can be used in arrangements, along with its delicate foliage. Branching stems of light to dark green, purple, blue or greyish-green leaves. The flowers are bell-shaped with four petals, and dry well. Produces small white berries, with small oval green leaves. Ideal foliage for Christmas weddings. Funnel-shaped, brightly coloured flowers at terminals along each long stem. The flowers are excellent for cuttings. Funnel-shaped, tubular flowers that are plain or striped, in red, blue, purple, scarlet and pink. Variously shaped leaves that are aromatic and in shades of green, silver and grey. The flowers are cylindrical and are either singular or clustered. Solitary bowl-shaped white flowers that are aromatic. Also produces fruits suitable for Autumnal weddings. Multiple long-lasting, trumpet-shaped blooms that are lily-like in appearance. Colours include white, pink, salmon, orange-red, and red. Aromatic leaves and fragrant star-shaped white flowers, suitable for cuttings. A very traditional bridal flower. An unusual, unique flower structure that can be expensive. Grows in many varieties including pink, orange, red, yellow, white and maroon. A five petalled flower, either plain or with a patterned ‘face’. Can be unscented or slightly scented. Colours include yellow, lilac, purple, pink, blue, red, orange, black, brown and white. Tiny star-shaped, white or greenish-yellow flowers with clusters of small triangular leaves. Each flower has a wide tubular base and five to ten petals. It is an exotic flower, with saucer or bowl-shape, and predominantly purple. Solitary, bowl-shaped pale pink flowers. Also produces fruit that can be used in arrangements. Large, erect flower heads, with either single or double petals in a saucer, cup, bowl or spherical-shaped. Each flower has five to 10 petals that are fragrant. Colours include yellow, white, cream, pink, orange and red. Funnel-shaped flowers with six petals. Orange, pink, cream, red and yellow. Dwarf varieties also available. Either compound or singular flower heads, with a raised centre. Blue, white, yellow and pink. Glossy, leathery leaves with five-petalled flowers that are either singular or clustered. An upright shrub with large, mid to deep green leaves. ‘Pulcherrima Menorca’ bears large, bright red flowers. Short-lived flowers with either bowl, cup or saucer-shape. Four petals in either red, peach, yellow, orange and white. They have a tendency to wilt, but florists will be able to offer advice. Tubular, bell or funnel-shaped flowers, either clustered, on a single stem or in a ring around the stem. They are often fragrant and are yellow. Sweetly scented flowers that are produced singly or clustered. Grow in a variety of sizes and shapes, but are usually five-lobed and have flares or spots inside. Often fragrant flowers, either solitary or grouped. They vary greatly in size, form and colour. Shapes include flat, cupped, rounded, urn, rosette and pom-pom. An ideal foliage, that is scented as well as attractive. The flowers are a tubular shape and a purple-blue shade. Aromatic foliage and flowers. The flowers are yellow with four to five petals. Foliage can cause irritation to skin. Tubular, bell or funnel-shaped flowers that are usually aromatic. The long stems produce many terminals of flowers. Spikes of small, papery flowers. Grown in a variety of colours, including white, yellow, orange, pink and purple. They are good for cutting and drying. Tubular lipped flowers, in clusters. Colours include white, yellow, orange, red and pink. Delicate, pear-shaped white flowers that are sometimes scented. Long, thin strips of green foliage. Also produces small, yellowish-green flowers. Long stems with outward facing flowers in purple, blue, pink and white. Small flowers found in green, white, purple-red or brown. Produces clusters of around 15 flowers. A traditional white bridal flower with a pleasing scent. The waxy flowers are tubular-shaped. Large, bold, yellow/orange daisy-like flower heads with differing petal shapes and sizes. Can look striking in groups of five or six. Delicate, fragrant flowers in varying colours, including white, pink, red, blue, lilac and purple. Terminal clusters of many small, single, scented flowers in purple-red, pink, salmon-pink and pink. Heads or clusters of small, tubular-shaped flowers. Colours include pink, purple and white. Upright flowers with six petals, either singular or clustered. They vary in size and shape – single or double, cup, bowl, goblet, fringed and star shaped. Various colours available, including red, pink, cream, white, apricot, purple, yellow, orange and maroon. Tubular to trumpet-shaped flowers that are often fragrant. Produced in terminals or clusters, often domed or spherical, and can be cream, flushed pink or wholly pink. Also produces ornamental fruits of red, blue and black. Delicate flowers with four petals that can be purple, red, orange and yellow. Large, bowl-shaped flowers that have many narrow petals and are grown in various colours – white, yellow, pink, red and blue. Tiny yellow flowers with four to five petals, often sweet scented. The foliage is also used. Delicate star-shaped flowers with five petals. 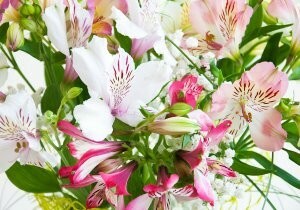 The flowers have an aromatic scent, and are available in white, pink, red, blue and mauve. Small and densely clustered flowers in blue, white or pink. Open saucer-shaped to shallow cup-shaped flowers, either singular or clustered. Sizes range from petite to large. The sap may irritate skin. A white variety is available, called ‘The Bride’ (Anemone Coronaria). Pea-like flowers that are fragrant and have dark leaves.